One of the worlds’ worst kept secrets is that a Warcraft III remaster is probably in the pipeline at Blizzard. We’ve seen job listings from Blizzard advertising for designers to “breathe the original soul of our classics into new forms” and all but confirming Diablo II and Warcraft III remasters. For more games like Warcraft III, check out the best strategy games on PC. Though there’s demand for a Warcraft III remaster, and a team that can do it in Blizzard’s Classic Games team, Bizzard haven’t officially announced they are working on it. The developers claimed late last year that, unlike StarCraft, Warcraft III isn’t ready for the remaster process yet. However, invitations received by players to a secret Warcraft III offline event could suggest Blizzard are ready to officially announce the remaster. According to Wowhead, several international pro Warcraft III players, including Foggy, Happy, and HawK, have been spotted trying to obtain visas to enter the US. Happy revealed to GoodGame.ru (via Wowhead) that the pro players have been invited to a secret offline Warcraft III event, were an announcement is expected to be made. 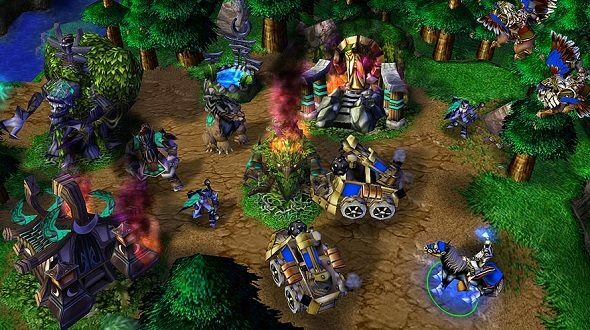 Though hopes are high for Warcraft 4, or another ‘big’ project, it’s likely the announcement will be the unveiling of a Warcraft III remaster. Blizzard have already started balancing the original game, hinting that they could be paving the way for a remaster and fans seem to agree. There’s no word of when or what the event actually is, but it could be soon considering international players are rushing to get their visas.